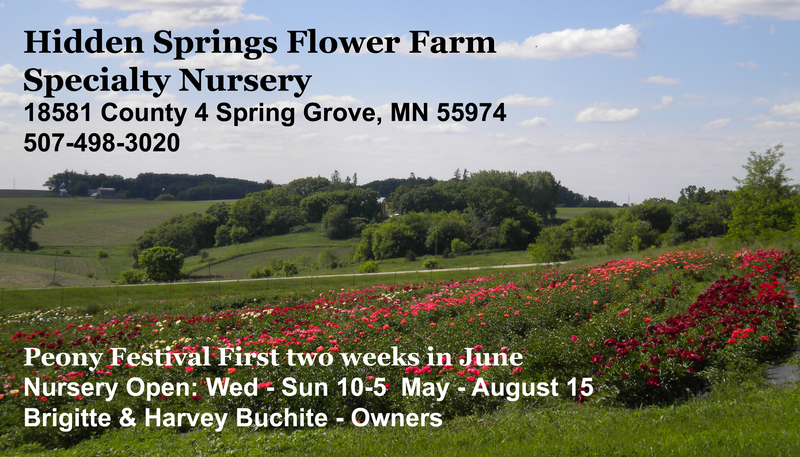 Hidden Springs Flower Farm is a family owned farm and nursery operated by Brigitte and Harvey Buchite. Although we are known for specializing in peonies we also grow and hybridized and sell; daylilies, hardy perennials, rare and unusual woody and woodland plants. Recently we have added heirloom apples and the new generation of disease resistant apples along with cherries, pears and a hardy new peach we are trialing. Located on 54 acres in the beautiful Bluff Country of Southeastern Minnesota in Spring Grove. Although we work all year growing and propagating the plants we sell the nursery is open from May - Mid August Wednesday - Sunday from 10 - 5. Starting in September we hand dig and carefully prepare peony roots to ship nationwide at the proper time for planting. 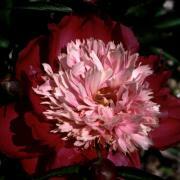 We only ship bare root peonies in the fall and all other plants we grow and propagate are available at the nursery. Over 600 peony varieties are grown in the sunny, well drained, fertile soils nestled between wooded hillsides. 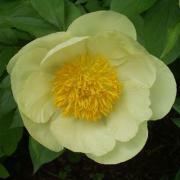 We take personal pride in growing high quality, true to name peonies. From the highly collectable and proven Heirloom peonies to the new Itoh Hybrids we offer a wide selection of peonies including; large blossomed fragrant garden varieties, botanical peony species, the red fern-leaf peony and hard to find and much sought after hybrid peonies in vibrant true red, yellow, coral and unusual colors. We are true peony specialists having spent many years growing from seed a large number of the wild species peonies from around the world. The mature plants that we offer our customers save you up to 7 years of growing the small seedlings. Our peony hybridizing program includes several varieties selected out of thousands of seedlings currently going under final evaluations before registration and we have released two varieties so far including the very fragrant Romantic Lace and Romantic Elegance, both of which continue to be quick sell outs. 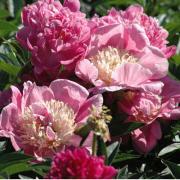 We are hybridizing zone 4 hardy tree peonies grown under rigorous field conditions without winter protective cover. Our collection of 70+ tropical Orchid Cactus makes us a destination for Midwest gardeners looking to brighten their indoor gardens. Sizes vary from Quart size starters to 8", 10" and 12" premium size hanging baskets. 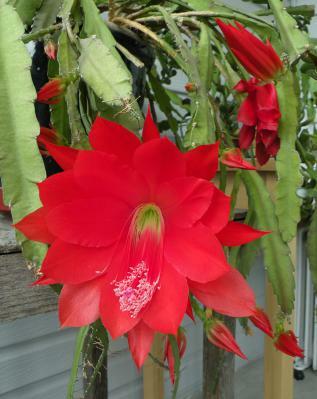 Owners, Brigitte and Harvey Buchite have been involved in raising plants nearly all of their lives. Harvey graduated from the University of Minnesota with a degree in horticulture and spent 17 years working for the U of MN and MN Extension Service, followed by 10 years as a partner at Rice Creek Gardens, a specialty plant nursery in Blaine Minnesota. Brigitte, a native of Austria, graduated from the University of Bodenkultur in Vienna, Austria with a Masters Degree in Agriculture. Harvey and Brigitte introduced the gardening world to Wisteria Blue Moon, their own selected seedling that has proved to be hardy to -40 degrees and blooms three times a year in long clusters of fragrant flowers. Harvey is a popular garden speaker, with presentations on; Peonies, European Alpine and Rock Garden Plants, Perennials, and Daylilies. His presentations have taken him to garden and specialty commercial grower groups in Canada, Europe, and from Portland Maine to Portland Oregon and throughout the Midwest. 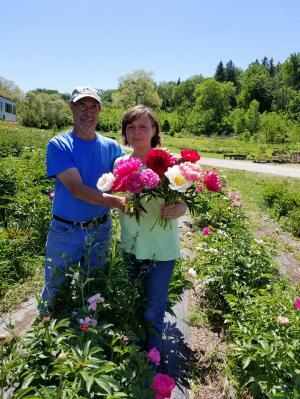 As past president of the American Peony Society and past President of the Minnesota Peony Society he is deeply committed to helping others learn about one of his favorite plants. Many of his peony articles can be found on the Web, in various publications including the American Peony Society Bulletin. Extensive travel to visit nurseries and gardens has allowed Brigitte and Harvey to scout out a wide variety of select and unusual plants. We enjoy sharing our passion for rare and interesting plants by making them available to our customers. Our active peony, daylily,and perennial hybridizing programs allow us to bring the best and hardiest plants to our customers, well suited for our demanding climate extremes. Happy Gardening and Thanks to all our past and new customers!